A high ankle sprain is a specialized injury of the ankle above (high) the joint itself. The involved ligaments (Anterior Tib-Fib Ligament, Posterior Tib-Fib Ligament, and Interosseus Ligament) are also named the syndesmosis and holds the fibula to the tibia. 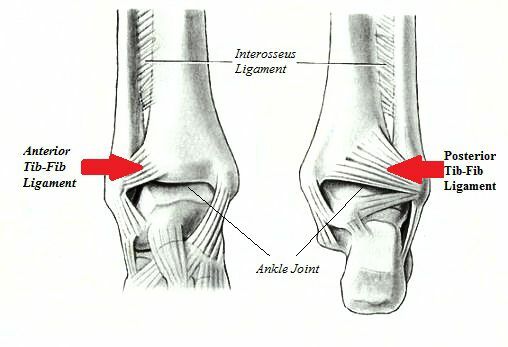 When these ligaments are injured, the ankle may be "stable" or "unstable". An unstable high ankle sprain will allow seperation of the fibula from the tibia and produces significant pain with motion of the ankle or even standing on the ankle. Often these injuries may not heal appropriately and may require more aggressive treatments (especially if the instability continues after the initial recovery). A stable high ankle sprain is usually painful, but not accompanied by weakness of the ankle. These injuries are usually short-term and treatment consists of simple ankle sprain type treatments. Rest: Limiting activities for 2-4 weeks is often necessary to allow proper healing of a "stable" high ankle sprain. This may include bracing or even placement in a walking boot that takes all motion away from the ankle. The boot is usually more successful at treating the unstable sprain. Ice: Ice is more important than heat due to its ability to reduce swelling to the ankle. Compression: Swelling is often the key reason the ankle sprain hurts. We recommend compression with a brace or ace wrap to reduce the swelling and help limit the motion of the ankle some. Elevation: Gravity is the most powerful instrument in causing swelling or reducing swelling. By elevating the leg above the heart, the ankle will swell less and hurt less. Additional treatments may be necessary if the high ankle sprain doesn't resolve and may include additional immobilzation or casting and surgery. The newer surgical correction options for this procedure involve a small incision and rapid return to normal activities. If you high ankle sprain is not resolving or keeps happening, the High Ankle Repair options should be considered.